OfficeDrop first gained our attention with a document management system that allows users to scan documents to the cloud using nearly any scanner or mobile device. On Thursday, the company will announce a new element of its service that enables PC users to upload entire Windows folders to the cloud with a simple right-click of their mouse. Healy Jones, OfficeDrop’s vice president of marketing, tells us most of the company’s clients are small businesses who have existing organizational architectures based on Windows. These folks don’t want to rearrange their digital lives to get files into the cloud, so OfficeDrop’s engineers found a way to make the company’s service as familiar and intuitive as possible. OfficeDrop isn't the first cloud-storage service provider to offer this feature--MediaFire has it, but Dropbox and SugarSync do not. Right-click and sync your folders to the cloud in seconds. Once you’ve opened an OfficeDrop account (plans cost between free and $44.95 per month, depending on storage quota, support level, and other features), download and install the OfficeDrop Windows File Sync Client (currently in beta), and then right-click any folder on your PC that you’d like to sync to the cloud (you can sync more than one folder). If you’d like to share these folders with other people, log into your OfficeDrop account and update your sharing options. 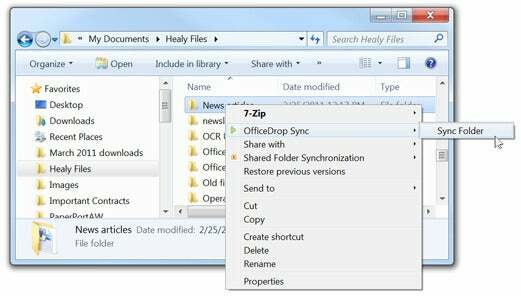 If you want to send someone a file--or an entire folder--from your OfficeDrop account, right-click on a file in any folder you’ve synched using OfficeDrop, and choose the Sync2Link option to email the recipient a hyperlink. The URL is automatically copied to your clipboard, so you can paste it into an email, instant message, or Twitter post. When the recipient clicks on the link, they gain access to the file from the cloud, saving them the trouble of logging into OfficeDrop and navigating their way to the file. 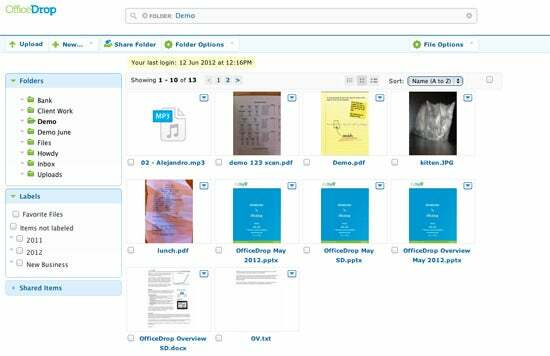 Scan a document as a PDF file (or upload a pre-existing PDF) to OfficeDrop, and the service will apply OCR (Optical Character Recognition) technology to the file so that you can search within the file. This is useful for people who collect a lot of paper documents--receipts, ticket stubs, and the like--but don’t have time to organize them for easy retrieval. OfficeDrop can’t replace Expensify for folks who must prepare detailed expense reports; but this is one of several features that identifies OfficeDrop as a document-management service in the cloud, as opposed to a simple cloud-storage service like Dropbox or SkyDrive. Here's an example of OfficeDrop's web-based user interface. OfficeDrop’s file-synching capabilities are similar to what you’ll get with any number of other services, ranging from Google Drive to SugarSync to Dropbox. What sets it apart from these competitors are its document-management features and this new right-click upload tool. Free accounts support one user, a maximum file size of 1GB, 50 pages of OCR storage per month, and 2GB of cloud storage. Sign up for a free account before the end of June, and OfficeDrop will boost your storage quota to 5GB. Angela West wishes cloud storage would accept her old record albums. Copywriter by day, she specializes in making website copy easy to read. Follow her on Twitter at @angelawest or check out her Facebook page for a compilation of all of her PCWorld Business Center posts.